The idea of Antyodaya is a key driving force behind this one mission, one direction vision. To transform the lives of the last man in the queue, be they farmers, the poor or the disempowered is a goal that has a set time line in the BJP Manifesto. The BJP has reiterated its commitment to doubling Farmer’s income. PM Samman Nidhi Yojana has been extended to all farmers. Pension for all small and marginal farmers after 60 years of age to ensure social security Rs 25 Lakh crores investment has been pledged to improve the productivity of the farm sector. Strengthen the Rashtriya Vayoshri Yojana to ensure that poor senior citizens in need of aids and assistive devices receive them in a timely manner. and ensuring 10% of Government procurement is from MSME’s having at least 50% women employees in their workforce. India a $5 trillion economy by 2025 and a $10 trillion economy by 2032 to achieve this a Capital investment of Rs. 100 lakh crore in the infrastructure sector has also been pledged. Additionally, a 1 lakh Cr Credit Guarantee Scheme for MSMEs has also been announced. BJP has promised to create new opportunities of employment by providing more support to the 22 major ‘Champion Sectors’ identified as the main drivers of Indian economy. A new scheme to provide collateral-free credit up to Rs. 50 lakh for entrepreneurs has also been announced. Ensuring a corruption-free Bharat via effective governance and transparent decision making, as well as empowering citizens, ensuring time-bound delivery of public services, as well as exploring avenues to implement the Right to Service are the BJP’s commitment to Good Governance. 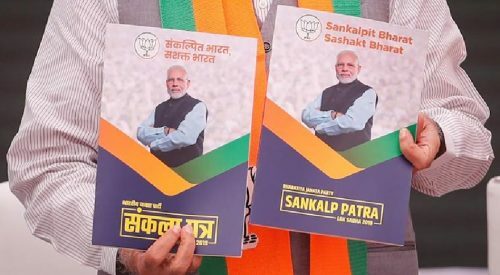 On the Education front, doubling number of MBBS and specialist doctors in the country by 2024 and ensuring Indian institutions rank among the top 500 in the world is promised in the Sankalp Patra.